I grew up with four brothers who enjoyed watching football and wishing they could play. So, I became accustomed to football game noise in the background. In an effort to get to know my brothers, have something in common to talk about with them and understand the game, I found out that I had a fun obsession – I liked learning about the history of football. 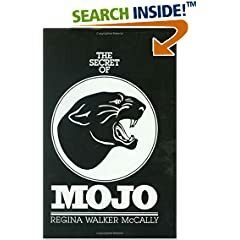 So, here’s my review of a book that was published in 1986 that follows the success of the Permian High School Panthers in Odessa, TX. I really enjoyed the fresh and honest eyes of the author, Regina Walker McCally, who claims in the introduction that when she moved to Odesssa she was not a football fan. For two years, she didn’t make any effort to join in the jubilation that the town seemed to possess for high school football. By chance, she reluctantly attends a football game because she couldn’t find a decent movie instead. The “Mojo” bug hit her and she became an avid fan following every move of the Permian Panthers for the next 15 years or so. It’s fun to read how much knowledge she has about this team and its history. I mean, she really got into it. I like her writing style. I’ve heard the saying “the truth is stranger than fiction” and she does a great job in making this book ring true with its rich football history. are you from/in Odessa, Julie? years ago, it was where i flew into, on my way to my company's plant in Big Lake, Texas. Odessa seemed like the end of the world - until i saw Big Lake. No, I'm actually from Utah. I now live near San Antonio, TX. We've been hear about 9 yrs. I've never been to Odessa or seen Big Lake but it sounds like I would want to now. Thanks for reading my review and for your comment. Midland-Odessa is probably an okay city. but Big Lake is a one-diner one-hotel smudge in the desert that is literally 100+ miles from any sizable civilization. Odessa to the west, and San Angelo to the east. nothing to do except go down to the one Circle-K and buy six-packs. i'd hate to be a kid or raise a kid in that environment. Ok, I misunderstood. So, I don't think I would want to visit Big Lake now. I think I agree with you that "i'd hate to be a kid or raise a kid in that environment." I was thinking of an actual big lake that my husband would want to go fishing in. He fishes and I read. My best friend used to live in San Angelo and it was awful there. I came and visited once, and it's literally like having a midsized city in the middle of nowhere. I wouldn't want to live there. And the drug underground there is really bad, apparently. Kind of like a lot of midsized cities in the middle of nowhere - lots of kids making meth in their barns and sheds. Okay, I realize that probably seemed random, talking about San Angelo - but they're pretty close to Midland/Odessa and from what my best friend has said, it's pretty much the same culture. Sorry if I confused anyone. Odessa and San Angelo are both out in the middle of nowhere - but they both have around 90,000 people. so at least there's theoretically something to do. Big Lake (according to Wiki) has a grand population of 2,885. and nothing to do. you have to drive a hundred miles just to get to Odessa or San Angelo. plus, there is no "big lake" in Big Lake. apparently, it's so named because there's a playa nearby, which Wiki tells me is just a plain that occasionally floods after heavy rainfall. thus the only pastime the operators had at our plant there was to get drunk. happily, we no longer own that plant, so i no longer have to go there. On google and goodreads you gave this book three stars. After reading your review it seems you have no complaints. May I ask what you did not like that granted it a three? Thanks, Anonymous, for reading my book review. I do have an reason why I would grant only 3 stars to this book. In my mind, 3 stars is a great score. This book was very informative, well-written and has a lot of reasons that I could have given more stars. Perhaps, I would bump it up to 4 stars. Rating systems rarely can be accurate because it's very hard to judge according to generalities. I only started to rate books because of places like goodreads & shelfari want you too. I don't really like to do so. I also give my best attempt to be kind and respectful with every book I review. I don't have to explain my rating system because it will only make sense to me anyway. It's based on opinion, not fact. 5 stars: One of the ULTIMATE books I've ever read! It was amazing because I considered new things and felt emotions while reading it. 4 stars: One of the BEST books I've ever read! It was incredible because it provided a new perspective for me. 3 stars: This book is GREAT! I learned or imagined from it. I liked it but it might not be for everyone. 2 stars: This book was ALRIGHT! It has potential and I did want to read it through to the end. 1 star: Honestly, not my favorite. I may or may not finish this book. Rarely, do I ever review books that would be a 1 star because most likely I wouldn't finish reading them. I hope this provides some explanation. Feel free to contact me further and let me know what you think.